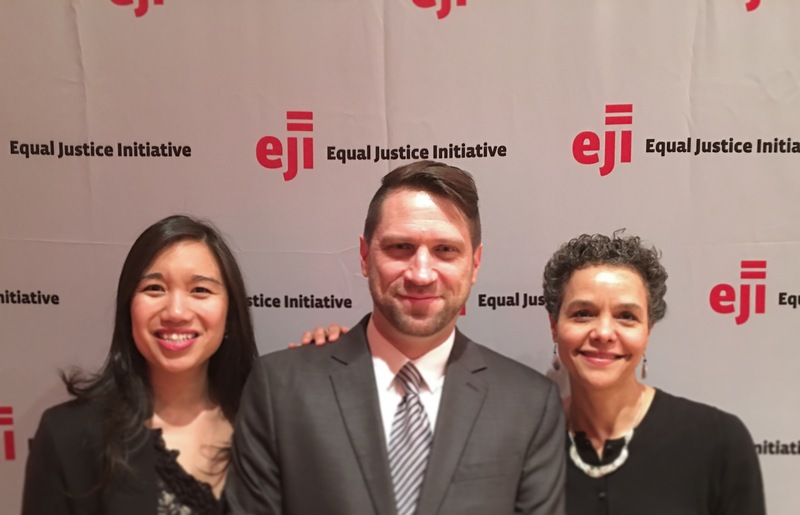 On Tuesday night, I had the honor of attending the annual benefit in New York for the Equal Justice Initiative, EJI.org with friends from work. Based in Montgomery, AL with offices that occupy a former warehouse for slaves, EJI exists to fight for people wrongly accused and serving life sentences (including those convicted as minors). EJI also seeks to broaden the conversation about race and injustice in this country. Among other projects, EJI has done extensive research to document the 4,000+ names of all those lynched in 12 southern states between 1877 (the end of Reconstruction) and 1950. Their vision is to help the US remember these terrible acts of violence as a way of bringing about healing, truth and ultimately reconciliation. They have begun to place markers at a few of the sites where lynchings occurred with a goal of placing one at every site. They are also in the early stages of creating a national memorial in Montgomery to honor these victims of racial terror. Public interest attorney and MacArthur award recipient, Bryan Stevenson, started EJI 27 years ago. Since the publication of Stevenson’s book, Just Mercy in 2014, the work of EJI, the untold stories of terror, and the connection of this legacy to contemporary manifestations of racism has been catapulted to a national stage. To describe the event on April 5 as moving would be a huge understatement. Multiple times I found myself choking up, overwhelmed by the stories we heard, humbled by the vision and efforts of one man who has committed his life to seeking justice for those who’ve been unjustly treated and condemned. (It’s a tangible example of seeing that which is more than one could ask or imagine….) To kick off the evening, Kathleen Battle gave a stirring performance singing several spirituals, followed by Serena and Juliana Wong who thrilled us with a violin and piano duet. Throughout the night, there were numerous short videos show casing EJI’s work and vision. At the end, Stevenson gave a short talk thanking us for already contributing to the work of EJI and encouraging us to give further so as to make the national memorial a reality. His deep humility and repeated words of appreciation were striking. The highlight for me was hearing from Anthony Ray Hinton who spent 30 years on death row – most of it in a 5′ x 7′ cell – for a crime he didn’t commit. (Let that sink in for a moment: that’s 3 years longer than Nelson Mandela served…) During those years, he watched 53 men walk past his cell to be executed. Hinton has just celebrated his first year of freedom which came after more than 12 years of litigation. Not bitter or angry, he exuded a deep sense of peace and joy. Explaining his rationale for forgiveness, he said: “I’ve not forgiven them for them, but I’ve forgiven them for me.” Hinton has now committed his life to sharing his story and doing what he to can to confront the injustice of wrongful incarceration. As if Hinton’s story and posture weren’t convicting enough, Stevenson followed that by explaining to us that Lester Bailey, Hinton’s best friend, had visited him in prison every week for all of those 30 years…. (That would be over 1560 weeks in a row!) If that isn’t a picture of a long obedience in the same direction, I don’t know what is. I’m convinced that this friend’s faithfulness, besides the dogged persistence of Stevenson and his legal team, is a key reason why Hinton survived that terrible ordeal as well as he seems to have. And emboldened him to come out determined to make his remaining years count for the sake of others. Bailey’s exemplary commitment to his incarcerated friend reminds us that there’s no underestimating the power of community, friendship, and taking the long view… It’s a visual demonstration of clinging to hope and living by the conviction of things not seen. The other honoree that evening was 107 (!) year old, Mrs. Maimie Kirkland, a lynching survivor born in Ellisville, Mississippi and now living in Buffalo, NY. Last year, 100 years after her father fled for his life with his wife and children, she returned to the house where she grew up, after vowing she would never go back there. The other man, John Harfield, targeted for lynching along with her father, also fled in 1915, but when he returned to Ellisville, he was subsequently lynched in full view of a large crowd. The work of EJI ensures his death won’t be forgotten and a marker will be placed where he was murdered. By God’s grace, Mrs. Kirkland’s family includes children, grand-children, great grand-children and great, great grand-children. Another take on a long view. Another (very) long life well lived. On a related note, I’m involved with the Grace & Race group at Redeemer Presbyterian Church and we’re hosting Bryan Stevenson & Tim Keller on Friday, May 20 @ 7.30pm. If you live in New York City, I would urge you to get your tickets soon. We expect it to sell out. Register here. It promises to be an engaging and convicting evening; it may even alter your life’s calling.